In the aftermath of the Rep. Gabrielle Giffords assassination attempt the governor of Arizona is describing it as a tragedy. As though nothing could have been done to prevent it. Her solution in answer to a question? Increased security. We listened to the Mayor of Tucson, the President of the United States, the President of Arizona State University, and the Tucson chief of police. To all of these people what happened in that Safeway Store parking lot was a tragedy. There was no mention — NOT ONE — about the fact that something other than a single-shot rifle must have been used to wreak this amount of havoc in so short amount of time. Guns don’t kill people. People kill people. Well this crime was not committed by a sling shot. 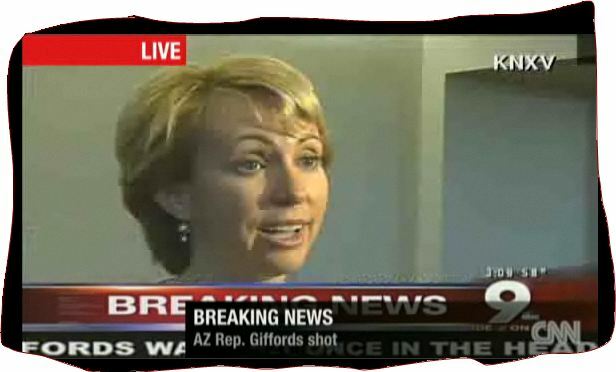 Rep. Giffords was shot in the head at near point blank range by some sort of automatic rifle. The sort that hunters would need only if they wished to gun down entire herds of elk or deer. The anchor staff at a local TV station in Tucson were clawing at the air trying to find words to describe their and their colleagues outrage over this incident. It was as though they were describing a natural disaster. These folks were plenty angry but not so angry they were willing to say something about gun violence. No one we listened to on myriad broadcast sources was willing to say the G word. It was as though they had an advance script supplied to them by the National Rifle Association. This federal public servant was DOING HER JOB. She was giving the people of her district an opportunity to meet with her person-to-person. Retail democracy. If, as Gov. Jan Brewer suggests, the solution is better security, how practical or realistic is it for Rep. Giffords or any other elected federal official to be among the people who elected them? Our democracy does not function well behind concrete balustrades and concertina wire. And we should not ask citizens to put their lives at risk simply for seeking an elected federal office. If we put a submachine gun in the hands of any citizen who wants one; someone is going to be off their rocker enough to go out and use one for the only purpose for which it is intended — shooting people. No amount of security can protect us. Not if we give a loaded handgun to every man, woman and baby in the United States. But the governor of Arizona won’t hear any of this. She backed Arizona’s constitutional amendment allowing handguns for everybody older than 21 with no background check or permit. The President of the United States recently signed a bill that includes a rider allowing people to carry guns in their cars when traveling through national parks. So we are left with no solution really. In my lifetime, Leo Ryan is the only member of a member of Congress to be gunned down while doing his job, 1978, Jonestown. This is truly a dark day for this country. A dark day for “the American experiment.” Can democracy survive if its elected officials must fear the very people who sent them to Washington? This entry was posted on Saturday, January 8th, 2011 at 5:23 pm	and is filed under 44th President, Gun Violence, Idaho, Journal, Lewiston, Politics. You can follow any comments to this entry through the RSS 2.0 feed. You can leave a comment, or trackback from your own site.